One of the joys of being a grandparent is being around for grandchildren’s pleasure in simple things. 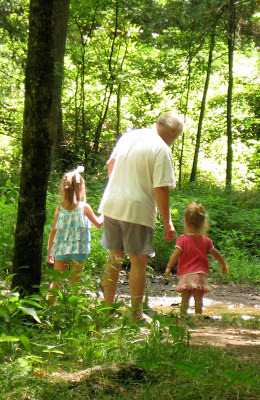 Here are a few moments from the potent mix of grandkids and the Smoky Mountain camping experience. 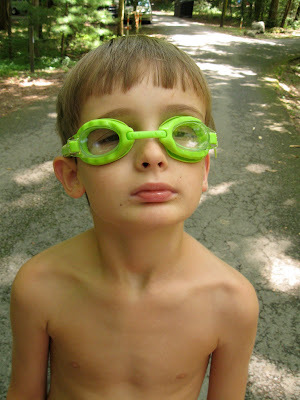 Eight-year-old Luke prepares to try out new goggles in the mountain stream. Four-year-old Charlie and two-year-old Stella visit the stream behind our campsite with Baboo. 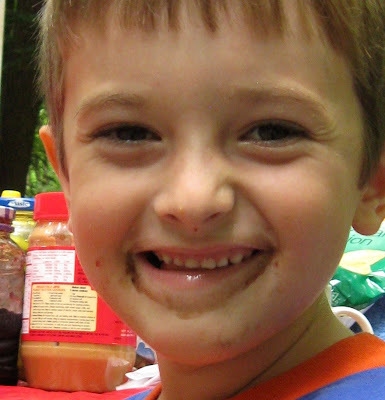 Five-year-old Nate models his hot-chocolate facial art. 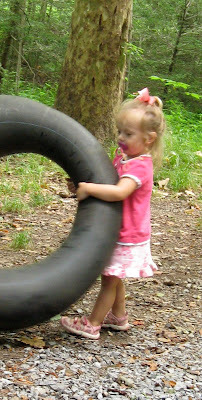 Determined to keep up with her older siblings, Stella wrestles an inner tube into position to roll it down an embankment. beauttiful grandchildren. i see they call there grandfather baboo. my mothers sister married Delbert. for some reason all the grandchildren call him Bobby. the first grandchild started it and he has been bobby ever since. @Sandra - The power of the first grandchild - Bobby from Delbert! The origin of Baboo was also first grandchild and just as much a mystery to us. Thanks for dropping by! Precious pictures of precious grandkids. I especially like the one of Grandpa and the girls. Makes me want to say awwww. Today we will have our 15 year old granddaughter and her dog stay with us for 3 or 4 days. I'm looking forward to her being here. She is a real sweetheart.